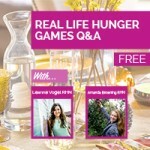 How to satisfy different hunger cues, what they mean, and how to connect the hunger you experience with the types of foods you’re eating… your real life hunger games. Hunger is a funny thing. I remember experiencing intense hunger when I was young. Growth spurts, non-stop activity, I ate all the time. But somewhere along the line, I stopped trusting my body and restricted what I was eating. I stopped listening. All queues from our body; including the ones we receive when we’re hungry, are like a muscle – if we stop paying attention to them, we lose the ability to hear them. If we can’t hear what our bodies need it makes it really difficult to understand when we’re hungry versus when we’re not. Whether you’re on top of your hunger game or are so far removed from the practice of mindful eating that you have absolutely no clue why you’re here reading this mumbo jumbo about mindful eating and understanding hunger, today’s Q&A is for you. A must listen if you’re ready improve your health and mend your relationship with your food and your body. Connect with Amanda on her website.